Early Connections, Inc. is thankful to the East Erie Moose Lodge #593 for their donation of $500. The Moose Lodge support s family-friendly causes throughout the community. 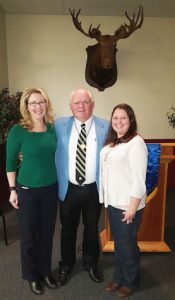 From left to right: Michelle Harkins, Associate Executive Director, Early Connections; Craig Westover, East Erie Moose Lodge Governor, and Stephanie King, Director of Early Connections West Side. Thank you Moose Board and Members!